In Matthew 16:13-20, the Lord instructs his disciples regarding some crucial aspects of his kingdom. Whenever we speak of the "kingdom of God" or the "kingdom of heaven," we must remember several things. First, Jesus is the king of that kingdom (indeed, the King of all kings). Second, his kingdom will ultimately be populated by all his chosen people who have ever lived in this God-created world. Third, the kingdom of Jesus has rules of operation and conduct, which our Lord gave us in order that we might increasingly glorify him. Finally, the kingdom of Jesus is the ultimate power in the universe. I love to preach. I love everything about preaching: the preparation, anticipation, delivery, and follow-up. I love it because of what preaching is, not because I am good at it or because it is easy, or because I never mess up. I recognize that this love for preaching is a wonderful gift of grace given to me and, in turn, to the church. It is a gift for which I am responsible. 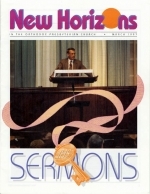 The sermon is the central act of Reformed worship. It plays a crucial role in our Christian life. God uses it to bring us to salvation and into a living relationship with himself through Jesus Christ. Therefore, God's Word must be expounded in such a way that it shows us our place in Christ and his work for and in us. Not all sermons are equally useful, and neither are all methods of expounding the text.